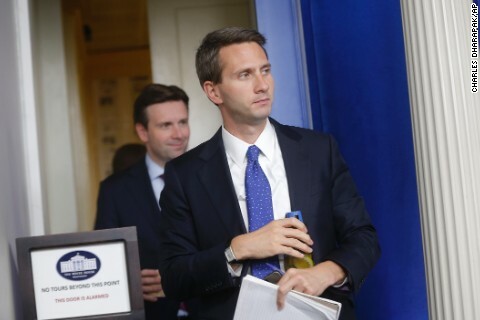 Washington (CNN) - The Obama administration Wednesday announced Eric Schultz as its pick for the new principal deputy press secretary. Schultz will now be the number two White House spokesman behind the new Press Secretary, Josh Earnest. Earnest, who began his role in June, previously held the position. Schultz will be responsible for filling in for Earnest behind the White House podium or holding off-camera briefings with reporters aboard Air Force One from time to time. Schultz is traveling with President Barack Obama on this week's three-day fundraising trip to the West Coast and will hold his first official "gaggle" with reporters in his new role this afternoon. Schultz is known among the DC press corps for having an assertive style. Part of his portfolio has been dealing with some of the more difficult stories the White House has faced in recent years. He also has a strong campaign background. He served as communications director for the Democratic Senatorial Campaign Committee in the 2010 cycle, was national press secretary for John Edwards 2008 presidential campaign, helped run Al Franken's 2008 Senate campaign in Minnesota, and was a communications director for Sen. Chuck Schumer of New York. The move, which was expected among the White House press corps, is part of larger regrouping as a number of aides in the White House press shop have been coming and going in recent days. "Like other successful organizations, we're not rebuilding, we're reloading. The new members of our team are some of the brightest political communicators in the country," White House Press Secretary Josh Earnest said. "While each of them has already served the President with distinction in other roles, I'm confident they'll re-invigorate our White House team with the talent and professionalism that has been the hallmark of our operation for years and will be critical to our success as we tackle the important challenges ahead." The White House also announced the addition of three members to the communications team. Jen Friedman, who joins the shop from the National Economic Council, will become a deputy press secretary. Frank Benenati, recently from the OMB, and Brandi Hoffine, from the Treasury Department, will both be assistant White House press secretaries. Matt Lehrich, an assistant press secretary, will be leaving the White House soon. Dag Vega, the White House's director of broadcast media, also announced he's leaving the White House for the private sector next week. perk-lover, while our world darkens-daily. 10 k, for lunch, what a rip off frank, for the same 10 k, you could have attended George w bush's seminar in the Cayman islands, you know the one on election night, how to offshore your accounts, and avoid paying taxes to the u.s. government. Them liberals will never learn, how was the seminar by the way, you don't know, you weren't there, you mean you don't have hundreds if millions to stash, rube. But I'm sure w still loves you, maybe he can paint you a picture, lord knows the written truth doesn't sink in. Empty suit, community organizer, do nothing, out of touch, clueless vacationer. AND evil cunning dictator pulling off the greatest criminal cover-up in history. Is it any wonder the average person rolls their eyes at conservative auto-rants? SDG, I have no idea what you are talking about, other than to express hostilities (#1 & #3). If you have something to say, say it. You are obviously too lazy to actually make a point. tom l, just for the record, I am more than willing to call out out anyone for posting nonsense: the fact of the matter is that agreeing with people rarely makes for a good Ticker argument. You should be more concerned about your own diminishing credibility than supporting Tommy G's pathetic efforts to make me out to be a mindless shill. Your own experience with me should tell you he's bitten off way more than his blinkered gob can chew, and that he practices exactly what he accused me of. Btw, I supported Rand Paul in the Ticker yesterday, against the statements of the Gang, so I think you need to review my posts from yesterday. The Obama admin. can make some swaps but at the end of the day you can`t polish a terd. Bush tried the same tactic. I was expending about as much energy as your quickly typed jab at the President and the DOJ warranted. But I see some explanation is needed and I will try to limit my word size. I don't think you are doing enough research into what has actually been done in response to the obvious will of the people in recent state law changes. I believe there is evidence that the administration is changing based on the last two years of related DOJ announcements. "This is going the same way as gay marriage! No stopping progress!!" Mwahahahaha....yes....the "plan" is working perfectly....pretty soon we'll have mandates that everyone must smoke pot, be gay, treat minorities equally and have health insurance!!!!! Oh how the GOPers/Teatrolls will weep...on theirforced gay spouse's shoulder!!!! Mwahahahahahaa!!!! @Tommy G, if your original remarks regarding the ACA had been anything but canned Right-wing talking points, you would have gotten a better response. Clearly, nothing you post is anything more than that, and if you were presented with data to refute your argument, would you have accepted it? I doubt it. I have not seen one post from you that has not been anything more than propaganda, so please stop with playing the victim because your " points" are a joke. You don't want a discussion, just validation. And now we have Round 2 of the canned leftist drivel response. Again, no facts to refute, now it is, what you post is just talking points and a joke, unworthy of discussion only dismissal because of course only the lefties know what is right and true and worthy of discussion. Again, when you cannot refute the facts, and name calling doesn't work, plab B is invoked, just claim the other persons point of view is just unworthy. Or maybe even the dreaded made up scandal or the other go to, the false equivalency dodge.